I am on a team to do a sprint triathlon and have been training for the running portion since December. Although I can do the 5k on a treadmill, I am completely out of breath and can't wait for the run to end. Outside my maximum mileage is only 2 miles. How often should I be running and why am I so out of breath? I have heard people say for years that they love running, they feel running clears their minds and makes them feel great. I can hardly wait for the runs to be over and after the race I will probably quit running as it is not enjoyable for me. Any suggestions on how to make it more enjoyable and easier for me to run? Sorry to hear that running is that tough on you. What is definitely the case is that running on a treadmill is quite different than running outside. They say that you need to train with about a 1% incline on a treadmill to get the same exercise as when running on the road. So it is quite normal to be able to run less when running outside. What I think you might be doing is going way too fast. Your running training should contain of lots of slow, easy running. The pace at which you are able to maintain a conversation. 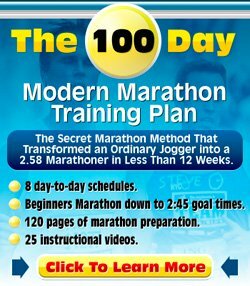 If every training is a race for you, I can imagine that your running training is not very enjoyable. Races require a lot from you which includes enduring pain and fatigue. But your running training should generally be a lot slower, with a few faster workouts in between. I suggest cutting down the speed for the next few weeks. In the meanwhile, pay a visit to my Running Training section and read up on the types of running training you can do. On number of days per week: highly dependent on what you are currently doing, what your goals are, what the rest of your exercise program looks like, but three times a week sounds about right and should give you enough running training to book progress. Best of luck. I hope you'll start enjoying running more and hope you do well in your race(s).